We have a good sized audience at East Southsea Neighbourhood Forum. I gave an overview of the air quality situation and then we had an informal Q&A session with Lynne Stagg (PCC transport) and Steve Pitt (PCC Culture and Leisure). There were some good questions from the audience on air quality policy and solutions. Both PCC councillors had to step in at short notice as the planned speaker Gerald Vernon-Jackson was unavailable. This was probably for the best as Lynne is probably more familiar with the issue. 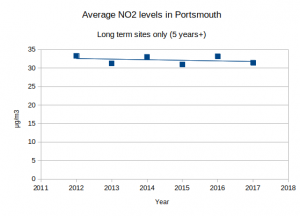 Audience question: If 50% of the problem comes from diesel, why doesn’t Portsmouth City Council either tax diesels or put in a plan to ban older diesels? Lynne Stagg: Now let me correct a few things. We have been working on the air pollution problem for quite a while. DEFRA identified two areas that are not compliant: one is the bottom of the M275 and the other is Alfred Road, and they have been done by modelling. The reality is the bottom of the M275 is compliant and has been for a long time. The data we are worried about, and we have been telling DEFRA for several years, is the Fratton Road, Kingston Road, London Road [area], and we are not compliant there and we have not been for a long while. The reason for that is it is very difficult to actually deal with it because it is a corridor, and the geographical nature of the area makes it worse than it would be anywhere else. There is no where for diesel fumes, etc. to escape. Although diesel is a bigger offender than cars, there are more cars the HGVs, for example. The greatest volume of emissions is coming from cars as a total rather than individually. ESNF Panel: So you disagree with Tim? Lynne Stagg: I disagree on that particular point, about the actual amount. Lynne Stagg: There are a lot of things we could do, and that we are doing. Between 1971 and 2011, the population of Portsmouth went up by 50%. Car ownership went up by just under 300%. There is your problem. There are too many vehicles on the road, it’s a simple as that. We can do lots of things about getting rid of them. One thing […] which is contentious is resident parking zones. Because, for the majority of houses in Portsmouth, there is only room for one car, if you have no off road parking. A lady three weeks back, she came to me and said “I have three cars, what am I supposed to do?” […] get invented an elastic road. When they do, they can stretch it and you can put extra cars on, you can have it. In the mean time, you only have room for one car outside your house. We can take a lot of parked cars off the road. I am very keen on taking the parked cars off [?] Road, North End, because apart from anything else, I know from the [? ], people are trying to park, the traffic is held up behind, we’ve got emissions coming out. Cutting engines in when you are waiting in traffic lights, they do it on the continent, I don’t see why we can’t do that here. There are lots of like that, that we are in the process of doing. Coming back to London Road, I think we have convinced DEFRA that it is not compliant, and they are listening to us, because we have real evidence and they are just modelling it. We have lots of things in the pipeline. A lot of these things take a long time to do because it’s a chicken and egg situation, for example: I’d like to see more cars get off the road but where are the buses? I’m frustrated, I could come here by the 17 bus. [?] I waited 25 minutes and the bus didn’t turn up! So I ended up getting a taxi. However, we haven’t got a good bus service because people are using their cars. So it’s a catch 22 situation, so there’s lots of things we need to do. But coming back to polluted air, there was a brilliant documentary 2 or 3 months ago called “The Air We Breathe” with twin brothers who were adopted. One of them [lived?] in Birmingham on a section of road very similar to North End. He did a lot of work, they were measuring the emissions from vehicles and this is how I know that HGVs, although individually give out more fumes because they are diesel. Because the volume of cars is much greater, the amount of emissions from cars is greater than from diesel [HGVs]. He did a lot of work with local shopkeepers who said we couldn’t possibly take cars off the road, they would lose their trade, etc, etc. Anyway, head on social, it didn’t for 24 hours. In that 24 hours, the NO2 emissions were reduced by 30%. They had the buses and cyclists going through, but all the cars and HGVs […] I stopped those 10 years ago because they used to come down London Road, North End. So, for particulates, there is no work being done on that. They put in trees in tufts, when they did this road closure. And they then washed the leaves of the trees afterwards, because the particulates settle on the leaves. I had no idea before I saw the programme. And they evaporated the water and the amount of particulates was amazingly high. So we need to have more trees in to take up the particulates, not the NO2 maybe. [?] It’s just a lot of these things, if you do one thing, you’ve got to look at the repercussions elsewhere. And I totally agree with you on planning. Steve [Pitt] will back me up. We put in objections when planning applications come in and if we turn down applications, they then go to appeal to an anonymous individual, the inspector in Bristol, who overturns [?] and then we get fined for having turned down [?]. 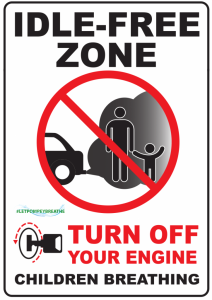 Audience member: You have a pretty picture on here, Tim, of an idle free zone. Have you got a question that I can ask somebody: I passed two taxis today, both by Tesco giving out diesel fumes. How can I ask nicely for them to turn their engine off? [?] he’d take no notice at all. Could we have a little card or something? Lynne Stagg: I shout out the window of my car and I tell them to turn the engine off. I often shout at cyclists that havn’t got lights on. [?] I was lord mayor [?] there was a cyclist who went through a red light and I said [to the driver] “slow down” and he said “you can’t lord mayor” and I said “watch me”. So I shouted “you have no lights on, we could have killed you. It’s OK of you want to die that’s up to you but I don’t want it on my conscience for the rest of my life.” So there are a lot of things we can do, if we just have the guts to do it. But we have a lady in Keep Milton Green [actually Tracey McCulloch of Let Pompey Breathe], and she designed one of these idle free things and we are looking at have them made up and having them outside schools, etc. But I think we need them at traffic lights as well. That is what they do in places like Germany. Not everyone will do it but if we put enough pressure on those drivers, they will start doing it because they will be embarrassed. It’s like those those lights flashing up saying you are doing 30 mph in a 20 mph zone. I’ve gone through some of those not realizing and I’ve felt so guilty when they flashed up that I immediately slowed down. It’s not going to happen immediately but it will happen eventually. Audience member: We could each have little cards that we could each give to the driver, that would be really useful. Lynne Stagg: I’m sure you can. I don’t know. It’s not my portfolio. [Lynne deals with Transport, not Environment.] I hold the portfolio that causes all the air pollution problems. [With a note of sarcasm:] I am therefore personally responsible for every traffic problem, every parking problem, every air pollution problem in the city. Hands up, I accept that. It’s not my portfolio but I will ask Dave Ashmore. Menno: I’ve got a question. I appreciate many things have been done over the years. Small things have been done to improve air quality. But as the graph shows that there hasn’t really been any actual change in air quality. So, isn’t it time to take more drastic measures now, because the measures that have been taken have proven not to be effective enough? They havn’t kept up with the increase in traffic around the city. Sure you can actually reduce traffic. Introducing resident parking zones is all well and good but that doesn’t help unless they are implemented across the entire city because you will just move the cars over to the next area. So, I think we really need to implement something more drastic and why not introduce a charging zone in certain areas of the city or in fact the entire island? Lynne Stagg: I think a lot of businesses will be against that. We have considered, a bit like London… charging… Our city centre is dying anyway. Lots of city centres and shopping centres are, and that is not going to change. So if you actually stop people from coming in, because they have to pay, they are not going to come at all. They are going to go to Southampton and Chichester and wherever. So there is the objection, so we try to do a balancing act. So I think sometimes you have to go around a problem to solve it, rather than head on. We’ve got to get things done by 2021 and 2022 with two of the Air Quality Management Zones. It has to happen. I’m trying to work with the bus company. For example, all the buses have to be retrofitted with Euro 6 diesel. It’s still diesel but it’s much much cleaner. That is going to cost between £1.5 – 2 million. DEFRA is going to give us some of the money, but [the rest] is coming out of our budget. And we have to save, what is it? $4.5 million this year. And the same next year, and I think more the year after. We have shrinking budgets. I’d love to put resident parking zones up across the city. We haven’t got the staff to do it. We can’t afford the staff, because we haven’t got the money because we paid for other things like retrofitting buses. There is only so far the money will go. We have to try to work within the budget we’ve got and try to pull in money from outside, like from DEFRA. We’ve put in a bid for $120 million to have bus rapid transport, coming from Waterlooville and Havant. Southampton are doing the same thing. The Eclipse route goes to Gosport and Fareham. It’s taken a lot of traffic off the A32 and therefore a lot of the air pollution but it hasn’t solved it. But you have to have something to replace what was going on. I have ideas and then try to find somebody to fund them. I want to have a bus depot in Portsmouth because our buses mostly come from Fareham. We could get bus companies from Eastleigh for example. But every time you do that, you pay for dead time. You have to pay for the driver and the fuel to get them to Fareham, and the pollution. If we had our own bus depot, we could have more buses, cheaper buses, serve a bigger area and hopefully more people would use them. Then get the cars off the road. But that doesn’t happen tomorrow. So there is a plan there. It’s like a jigsaw puzzle: you have a little picture and you have to get all the bits to fit in. Menno: The plan you are talking about, there is a plan in place, is that going to be published for consultation? Lynne: Yes because there is an air quality group that has been set up. [To Tim] And you’re involved? [Yes I am.] We’ve got to send that to DEFRA and have it approved by January . Yes, it will be, because the more people that feed into it… We’ve had meetings with lots of sections of the city. People come up with ideas that we don’t think of. So yes, it will definitely be published and consulted on. The more ideas the better.